Be aware I am going to contradict myself by stating The Rose of Roscrae is a border line brilliant; but could and should have been judiciously edited to make it a single album that would be mine and your album of the year. The album begins with the Overture sung by Jimmie Dale Gilmore and is followed by Russell’s deep voice telling us the story begins when he left his home in Templemore aged 16 to sail to the Americas and now at 85 he’s looking back on his life and the lost love, The Rose of Roscrae who was the reason he was banished from Ireland and becomes the thread that wove through it. Russell is probably the last great writer of Cowboy songs; which seems odd in Country music; but that’s how it is and those songs have always had a cinematic feel to them too; but here he has created a story that has a more theatrical production feel to it; and is crying out for Cameron Mackintosh to take these songs and create a Broadway production that will have them queuing up and down Broadway and London’s West End. 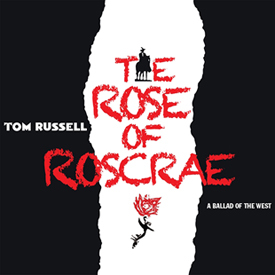 Some of Russell’s older and even Classic songs are included; sometimes as snippets but it will be the new songs for which this album is remembered; especially the Rose of Roscrae itself which is the cornerstone that the ambitious story is built around. Album #1 is more or less the story of the angry young ‘Johnny Behind the Deuce’ and the characters around him and searching for him; with David Olney reveling in his role as a corrupt judge on The Sidekick’s Last Testament and the duet between Jimmy LaFave and Gretchen Peters on Ain’t No More Cane on the Brazos will surely become a staple for male/female duos for years to come. The second album (Act #2?) is the second half of Johnny’s life and Eliza Gilkyson actually steals the show with her contribution as ‘the Rose’ and her duet with Russell on the Bear is worthy of Johnny and June; if not better than anything they ever recorded (fact). If we go back to my Theatrical observation; the way Russell seamlessly switches between Western songs, Irish laments, swooping orchestral arrangements and even a short French-Canadian folk tune is staggering in its complexity, yet perfect for the stage; especially if he himself is the narrator. It’s actually unfair of me to single out individual songs and contributors as this is very much an ensemble piece and needs to be listened to in one (very long!) sitting; but I defy you not to have tears in your eyes during the final two songs, Isn’t it Grand? and Maura O’Connell’s version of Rose of Roscrae which has ‘Award’ written all over it. There’s a lot here; perhaps too much spread over two albums and I doubt many people have the time to dedicate to listening for 2 and a half hours (I was on a very long car journey); so some judicial editing could make this a staggeringly brilliant single album.